Text and pix by M.A.R. 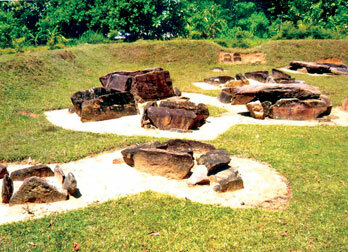 Manukulasooriya, Hiriyala group cor. A close-up picture of a cist tomb. There are several places of historical importance in Sri Lanka that are still not well known among foreigners and Sri Lankans. The Ibbankatuwa historical cemetery that belongs to the Megalithic pre-historic era is one such place. The historical site is on the Kurunegala-Dambulla main road in the Galewela Divisional Secretariat division. The Ibbankatuwa site covers an area of about one square kilometre and has 42 clusters of tombs with an average of about 10 tombs per cluster. The centuries-old cemetery shows that even in ancient times the dead were respected. The structures here are similar to those we see at today's cemeteries. The graves are enclosed with stone slabs. According to archaeologists, besides the burial place, human bones and tools used by them have been found at the site. Dr. Senarath Paranavithana who examined the inscriptions on the clay pots found at the site said they were similar to those found at the Mohendajaro-Harappa civilisation. 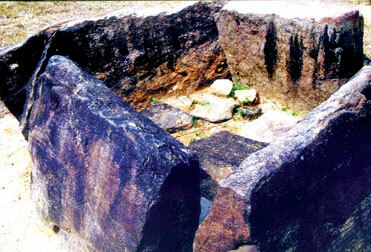 The excavations were carried out by the Cultural Triangle. Although thousands of tourist go past the historical place no one seems to be interested in visiting it. At present the site is preserved by the Department of Archaeology.